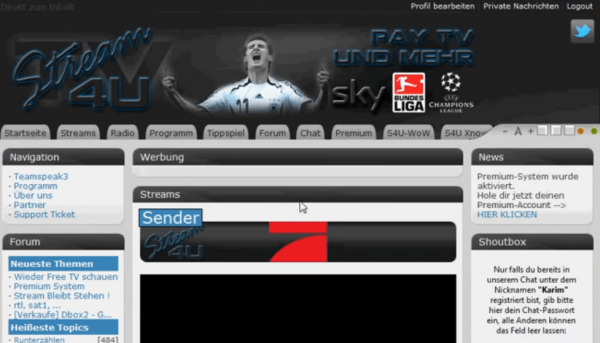 Sky Deutschland has won a copyright infringement case against the operator of live streaming site Stream4u.tv, as well as the provider of the hardware that was used to decrypt a Sky signal. The District Court of Hamburg, Germany, ruled that they must pay €18,000 in damages. While ‘pirate’ sports streaming sites have been around for over a decade, in recent years rightsholders have taken a more aggressive stance. The UK Premier League has triggered several police investigations, for example, which have led to the shutdown of several streaming platforms. In Germany, the local football league (DFL) and Sky Deutschland are involved in a similar battle. The rightsholder and broadcaster feel that unauthorized streaming sites threaten their livelihoods so they’ve initiated legal action in response. One of the prime targets of these efforts was the streaming portal Stream4u.tv, which was broadcasting sports events without permission. In addition to the site’s operator, a civil lawsuit filed by Sky also targeted the hardware provider that offered the equipment used to decrypt and distribute the streaming signal. Last week Sky declared a major victory after The District Court of Hamburg ruled that both the site operator and hardware provider are liable for copyright infringement. Together, both defendants must now pay €18,000 in damages. A clear win for Sky, especially since the streaming portal has been shut down as well. Aside from the damages, Sky highlights that this is the first time that a third-party intermediary has been held liable for copyright infringement in a case like this. They hope the result will send a strong deterrent message to others. According to Sky, the ruling effectively means that every technical service provider faces a significant liability risk if they are aware of the illegal use of its services and do not immediately address legitimate complaints. “The ruling is a warning for all those involved in the illegal distribution of Sky content,” says Thomas Stahn, Director Anti-Piracy & Technology at Sky Deutschland, commenting on the case. “In contrast to criminal law, every helper is also liable for the full damages suffered by the injured parties – regardless of whether or not it profited from the illegal business,” he adds. Sky informs TorrentFreak that the Stream4u.tv operator was not present at the court hearings, only the hardware provider. The company could not provide any additional details on the provider but noted that the hardware itself is not illegal. “The hardware in question was used to receive the Sky broadcast signal and encode it for transmission via the internet. The hardware itself is not illegal in general,” a Sky spokesperson told us. This isn’t the first victory of its kind for the German division of Sky. As Tarnkappe points out, late last year two people were convicted for their involvement with a sports streaming platform, resulting in a prison sentence for one of them. Sky Deutschland has several criminal and civil copyright cases pending in Germany, so this isn’t likely to be the last verdict we’ll see against sports streaming sites and services.